Update: Guide below is now out of date. 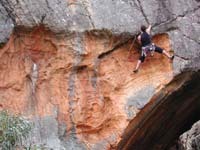 Visit http://www.climb.org.au/index.php?page=27&area_id=678 for latest version. This complex area has emerged from obscurity and now contains a wealth of quality sport, semi-sport and trad routes on some of the best rock in Victoria. With easy access and a good variety of grades this crag is destined for popularity. The three dimensional nature of the area means you can climb in the shade all day long or be protected from light rain. The big boulder caves also offer great exploration and have the habit of eating loose shoes or ‘biners. This area is located in the Victoria Ranges in the Grampians National Park, Victoria. Park on Red Rock Road immediately opposite the large pinnacle with distinctive steep orange west face about 1km south of Mt Fox car park. Hop over the fence and stroll across the paddocks and enter some light scrub hopefully spotting the local emus and grey kangaroos. The first big boulder with a couple of rusty hangers on the west face is Pellant Pinnacle. Much of this information comes from Michael Hampton’s forthcoming Victoria Ranges guidebook. Buy it in a store soon! Access: Victoria Gap 116794, 12 minutes, Flat. This squat boulder is 100m downhill from Red Rock Pinnacle. The routes are not very inspiring but might be useful for a warm-up. Descent is down the N face or by rap slings. Isolated pillar 50m south and slightly downhill from English Rose. Down hill and slightly north of Pellant Pinnacle is this stand alone pinnacle. Descent is off slings either back down the route or off rock spike down the other side of pinnacle (shorter). You can’t miss these two obvious overhanging orange pinnacles behind the paddocks to the south of Red Rock creek. The west faces contain a couple of very impressive old school routes which have began to get mossy on the lower slabs. On the back side is an assortment of newer semi-sport routes. 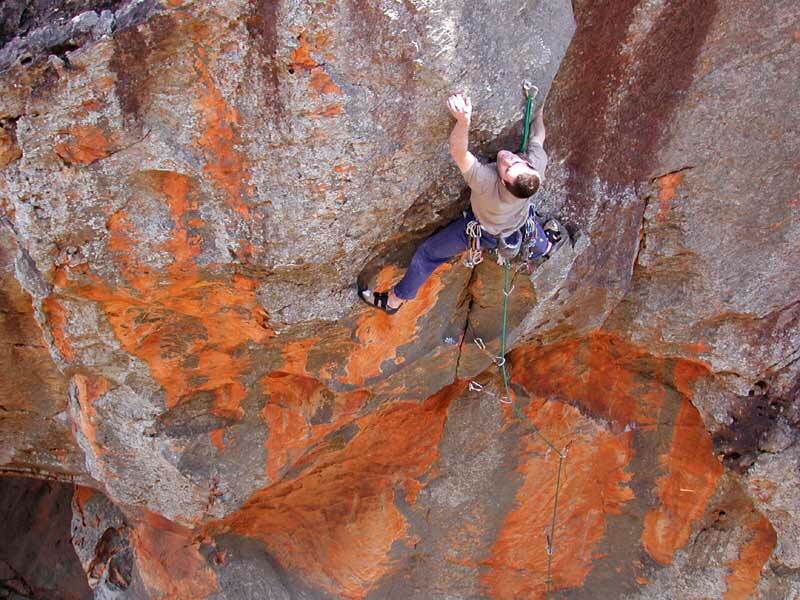 Right: Dean Chamberlain on the second ascent of Conflict of Interest (21). 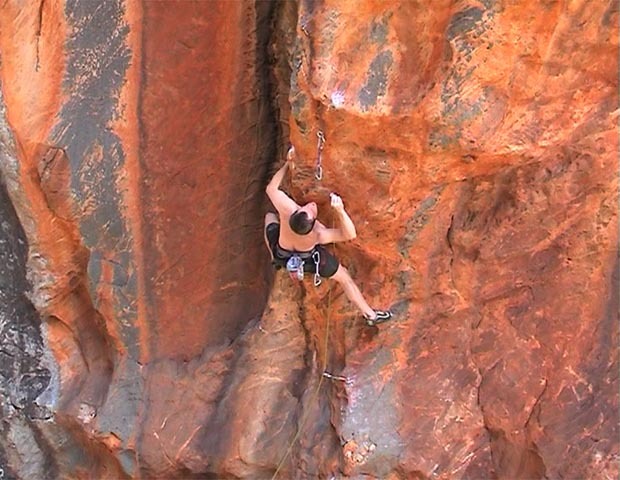 Right: Nick McKinnon repeats the sustained sandstone route, Variance (24), on the backside of Red Rocks. Right: Neil on the FFA of the bouldery Strike the First Blow (25). Orange bulging face about 20m right of Strike the First Blow. Overhung thin rounded crack. Any takers? From Strike the First Blow walk north about 30m past large boulder. 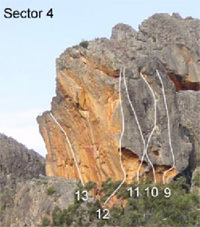 Head uphill for about 100m and locate large cleft on the rock wall to your right. This is the ‘trench’. An excellent bouldering area dubbed the ‘Skull Cave’ is located 50m out from the entrance. To get into the trench with the sport routes you must climb a 20m grade 2 bridging corner into the cave. 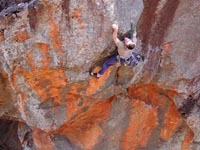 Right: Tim Marsh ticks the first ascent of Wave of Mutliation (24) on the superb rock of the Red Rocks area. 37] Pike Direct 35m 21? Two meters left of Cindy is a broken chimney which splits the slab in half. Start 1-2m left of this chimney (5m left of Cindy) and follow the cracks in the slab before weaving through the tufts of grass above. A tricky start with minimal gear quickly gives way to very easily protected if occasionally mossy climbing. FFA David Jupp, Michael Homfray & Tim Marsh 17.11.02. Excellent bouldering cave located inside perched boulder. You can traverse the entire roof in one pumpy problem. It is located 50m directly north from the entrance of the Marianas Trench. This is the original Gallery in the Victoria Range, not to be confused with the Buandik Gallery two kilometres further south. This Red Rock Gallery was named with art in mind, whereas with Buandik Gallery it was peanuts! A few hundred metres up the N side of Red Rock Creek from Red Rock Road are a collection of chossy pinnacles. The highest and E-most pinnacle has a long, overhanging north wall. Walk up the N side of the creek, around the E side of the pinnacles, and up the gully behind. Start from a cave passing R through the pinnacles. 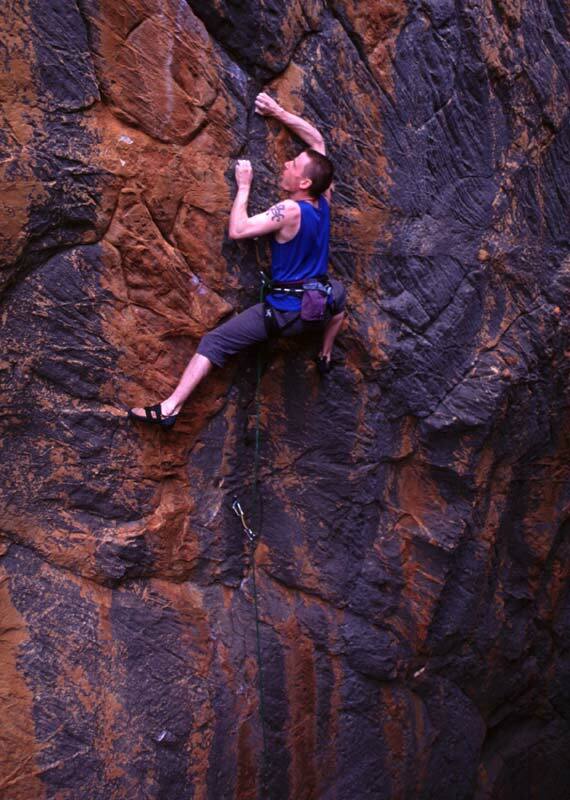 Slippery finger jamming in the striking diagonal flare, followed by easier but loose climbing to a dramatic finish. FFA Mike Law, Chris Baxter 2.12.1989. Red Rocks - More pics and notes from Neil's web site.